We Offer Diagnosis And Tutoring For People with Learning Difficulties. Dr Linda works with children and teens who are between the ages of 5 -18 who are tired and frustrated by low grades and are struggling to find their way through the maze of learning difficulties. With the need for children to be prepared to compete in an information-driven global economy, the academic bar has continually been raised again and again. Today, young people are put under the additional burden of more demanding tests and homework at earlier ages than ever before. 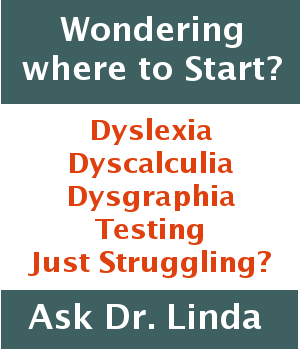 Typically Dr Linda and Strong learning work with children who are struggling to keep up with this burden in reading, writing, math and English, and want to do better. Your child seems to be struggling in school, your intuition tells you something is not right. Their grades keep dropping or going up and down. Your child may be doing fine in everything else, the problem is just limited to single subject. You don’t know why. Your child’s teacher has come to you saying that your child is falling behind, can’t stay on task, is easily distracted and should be assessed. Or worse, your child has been singled out for causing distractions in the classroom. Or perhaps you’ve heard those chilling words describing your child as ‘lazy’, a ‘slow student’ who ‘tries hard. They’ve not directly said that your child is subnormal or stupid, but that’s the impression they are giving you. Your child has problems in one of the following areas: spelling, reading, math, handwriting, attention deficit or hyperactivity. Traditional teaching methods don’t seem to ‘get the job done’ for your child which leads to even more frustration. Your child is bored by school, lacks concentration and attention. Some words just don’t seem to go in and become part of your child’s thinking process. This means that they are limited to rote repetition which they find excruciatingly boring and they are more likely to daydream than pay attention to this type of exercise. Your child is currently undergoing testing, going from one expert to another to another, and your child is getting exhausted and anxious from the endless testing. Your child may have completed an IEP, has been diagnosed as having a learning disability, but the special ed class they diagnosed does not seem to be working. You may even be in the process of being “processed” through the school, but no one is telling you what is going on which makes you feel a tad angry and frustrated. Your child’s learning difficulties having a big impact on their confidence and their self esteem keeps sinking lower and lower.What little progress you’ve made talking to your school about your child’s learning difficulties, the conversation tends to get emotional and the teachers become defensive. It is starting to dawn on you that no one seems to be on your side. You’ve been sent from one ‘specialist’ to another (child Psychologist, developmental psychologist, teacher, specialist education tester) causing endless stress, embarrassment, upset and confusion for your child. Each of these specialists have made pronouncements in terms of their own expertise, a plan was put in place and yet it’s still not working as you’d hoped. The endless mistakes your child keeps making trigger emotional upset for you or your teacher in class. Sometimes your child gets upset about making mistakes too which upsets everyone with them exacerbating the frustration for all. Your teacher may even have told you that your child is ‘immature’ or a slow developer or something similar. What about these behaviors. Do any of these remind you of your child? They do not know the difference between Tuesday and Thursday and frequently mix them up meaning they are often unprepared for each lesson. When you ask them to do a number of tasks, they can’t even remember to do one. At homework time, they frequently announce that they do not understand what needs to be done. They fall asleep in lessons. They are getting increasingly stressed and worried about the workload, sometimes only finishing homework late at night or early morning. If one or more of these scenarios or behaviors is true for you, please read on. You’re in the right place. There is help for you here. You are committed to your child’s success- Above all else you are interested in them moving forward and fulfilling their potential. You care about education and the educational welfare of your own kids. There is no way they are going down. Not on your watch! As your child is getting older, you fear you will have to go back to school in order to be able to help them with their homework. They just don’t seem to be teaching subjects these days like they used to, and you’d like to do something about it. High standards of excellence – Good enough isn’t! You are interested in your child’s future and the current system around them seems to be failing. They just don’t seem to be making the grade and it’s time to take action with a different approach. You know at least a little about your child’s progress so far– These days it’s difficult to keep up with everything that is going on. However you strive to be at least informed about your child’s progress and would really prefer to know more now you know that there is something that needs to be done differently. You’re a hard worker – committed to success – You are persistent and willing to try many things to achieve results. You realize you can’t know everything – But you are willing to get assistance and trust in someone who has been producing positive change for people like you for over 40 years. You are willing to invest in your child’s future- You know this is the best investment of all. Now that you know more about the kind of issues and problems that we help diagnose and fix, please click on this link to learn more about how we work.